Hey women’s leaders, we’re unrolling a brand-new six-week Bible study, Elizabeth: Dealing with Disappointment. This newest resource in our Women of the Bible series offers hope in the face of disappointment and heartache by exploring the triumphs and trials of Elizabeth found in Luke 1. It’s perfect for group or individual study. We’re inviting leaders to take an exclusive insider preview of the Elizabeth Bible study! We’ll send you a digital book copy, a digital leader’s guide, and a link to the first of six Elizabeth podcast episodes. Because we adore original hand lettering, you’ll also receive a beautiful art print and lock screens to remind you of the powerful truths you’re learning. Request your free preview kit by February 15! Sarah married the love of her life, whom God called to be a pastor, and their four children came in rapid succession. Sunday morning was the most stressful time of her week. Her husband left early to unlock the church and prepare for his morning of ministry. And getting her four little ones up, dressed, fed, and in their car seats single-handedly—never mind getting ready herself—proved overwhelming at times. 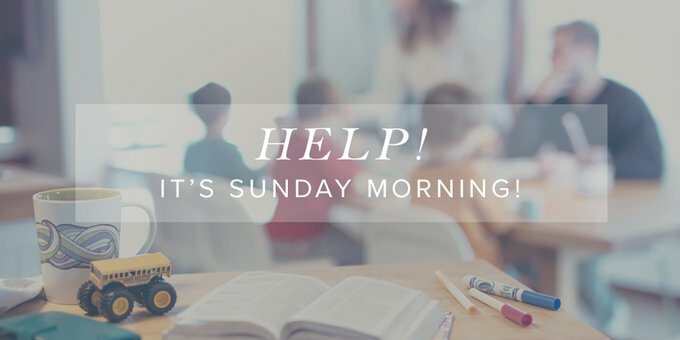 Knowing that she would need to cheerfully corral her little ones throughout the morning while introducing herself to guests and remembering the very real concerns of church members and friends added to her Sunday morning burdens. By the time she pulled into the parking lot, she found her heart longing to escape to any other place where there were fewer expectations. One Sunday, as she was beginning to get the kids out of the car, she couldn’t find her three-year-old’s diaper bag. She must have left it on the kitchen counter—again. When would he finally learn to use the potty! She could imagine his teacher’s forced smile as she dropped him off empty-handed. And then she noticed something even more disheartening—she had on two different shoes! Looking back she would find it quite humorous, but not this Sunday morning. Thankfully, Helen saw the tears brimming in Sarah’s eyes as she walked by. After helping Sarah and the kids into church she began thinking and planning, and a few days later she told Sarah about an idea she and seven other ladies wanted to implement. They had formed a “Zoo Patrol.” Each Sunday morning, two of these understanding older women would be at Sarah’s door one hour before church started to help her get her little zoo fed, dressed, and transported to church. What a happy bonus for everyone—pastor, pastor’s wife, zoo patrollers, and four little ones who had someone to help them pour milk and comb hair and zip jackets. I never had a zoo patrol, but I often needed one! We lived in Scotland for four years while Ray earned his PhD from the University of Aberdeen. Ray assisted in our parish church and left early on Sunday mornings. It was hard for me to get the kids ready (and willing) for our mile walk to and from church (we had no car at the time). I had to do something to curb the complaints and tears—and my own growing resentment. So I decided to try to make Sunday morning our best morning of the week. I made sure on Saturday night that their clothes were ready without the needless friction of “I can’t find my other shoe!” or “My zipper is broken.” We often made a sweet yeast dough on Saturday afternoon and had fun rolling out several cinnamon rolls to rise overnight. The children would wake up to that wonderful aroma, which still brings us back in our hearts to the tiny kitchen there along Royal Deeside. Some scrambled eggs and fresh fruit rounded out our favorite breakfast of the week. After getting the dishes into the sink, we would set out with “sweeties” in my pocket to reward cheerful and quick obedience. We would see who could make it to the next driveway without complaining or who could spot the next house with white flowers in the garden or who could think of three things they loved about Daddy before we reached the shop on the corner. Along the way we would talk about what a special hour was before us—the one hour of the week where we could worship God together with our friends. I asked the older children to give me, and others sitting near us, the gift of sitting quietly for just this one hour so we could pray and sing and listen. I encouraged them to try to join in as they were able. When I was first training them to sit quietly, I would give them more sweeties during the sermon. Then, on the way home, we would get the wiggles out with happy words about our time at church and many thanks for loving me, respecting the adults around them, and most of all honoring God with their quiet bodies. Around the lunch table I would brag to their daddy about their good behavior, and they would light up under his obvious approval. Was each Sunday as idyllic as I make it sound? No, indeed. There were Sundays when the cinnamon rolls burned or one of us was in a foul mood or—horror of horrors—I ran out of sweeties! Each Sunday I needed to rely on the Lord of the Sabbath for patience and resilience and perseverance, which He so generously gave—“grace upon grace” (John 1:16). Week by week it got a little easier as we started to embrace a pattern that brought us joy. Sunday morning became, with the Lord’s help, a “We get to!” rather than “Do we have to?” And, I might add, all four of our kids grew up with no cavities! I wonder if the Lord didn’t protect them from all my sugar bribes? What I am saying, dear friend, is that you have the opportunity of passing on to your children a joy for Sunday mornings. Children learn to love what their parents love. They will get excited about what excites you. Let them see the sparkle in your eyes when you tell them, “Guess what day it is tomorrow? Yes! It’s Sunday!” Let them hear the genuine warmth in your voice when you say, “I can’t wait to hear what our pastor will teach us about God today.” Let them feel the privilege of corporate worship together as you pray with them, “Thank you for our church and this special day.” Let them “taste and see that the LORD is good” (Ps. 34:8). This will take extra effort on your part. But it will be well worth it! Start small. Be creative. Ask the Lord to help you. Or pray for a Helen to organize your own personal zoo patrol! And as you do, your own soul will be better able to feast on the abundance of His house (Ps. 36:8). And your kids will begin to say along with King David, “I was glad when they said to me, ‘Let us go to the house of the LORD!’” (Ps. 122:1).